A case of morning showing the day? Let’s hope this year too shall pass with “flying” colors! Thanks to Facebook and my insane habit of posting, I found out from Maitreyi this morning that she was in Durgapur today too. My first reaction was – “Maitreyi?” Meaning “Rini?” Of the “Cholo Rini, Cholbe?” fame? The story goes back to my previous post. This was when I was to hang out at Sharmila’s place all the time. Mr. and Mrs. Sur was their next door neighbor. They had two kids. One very docile and goody-goody boy called Kunal – probably about five years old. And a firecracker of a girl – around three years old. And that would be our aforementioned Rini. Rini, as was her wont often, would find herself into Sharmila’s house and just park herself there and talk up a storm with any and everybody who would give her attention. One of those days, I guess, she had stayed on for too long. Mrs. Sur sent Kunal to retrieve her sister. Kunal, if not anything else, was surely mortally afraid of her younger sister. Asking him to tell her to do something against her wishes was like sending him to the gallows. I still remember that day – Kunal gingerly walking up to the front room of Sharmila’s house and almost bleating out to his sister – “Cholo Rini, cholbey?”. Roughly translated, he was fishing for her overall take on the concept of going back home when it was too late. No points for guessing but Rini pretty much told him exactly what she thought of the concept of telling her to go home when she was not ready. The rest of the day has always been a blur to me. Till date, I cannot stop laughing remembering that event. For ever that brother and sister was tagged with that “Cholo Rini, Cholbey?” identity in my mind. You can see their picture in the inset. Rini was literally as old as her son is – who I had the fortune of meeting and befriending today. I think he figured that I matched his IQ and warmed up to me quickly. Mrs. Krishna Sur has been the original inspiration for Sharmila to venture out of her educational profession (architecture) and pursue her love for paintings. 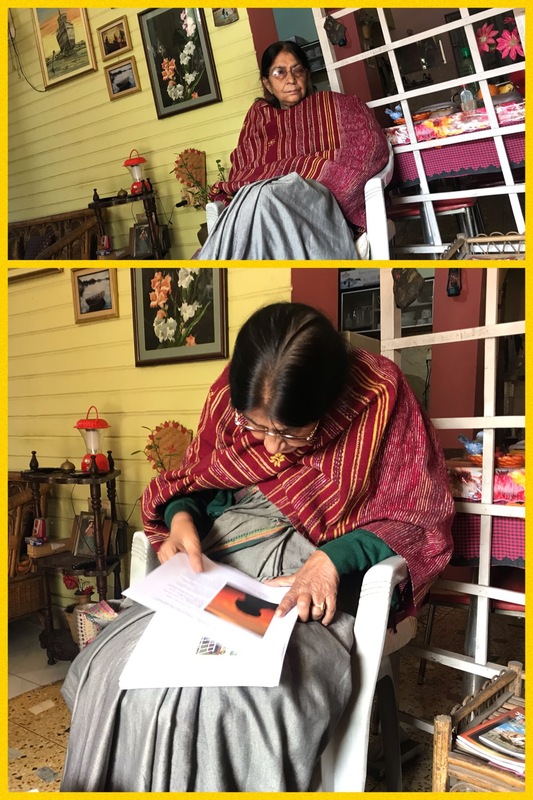 Being an unparalleled artistic person herself and one of the most successful entrepreneurs Durgapur has produced till date, she has been a great influence on Sharmila during her formative years and later. 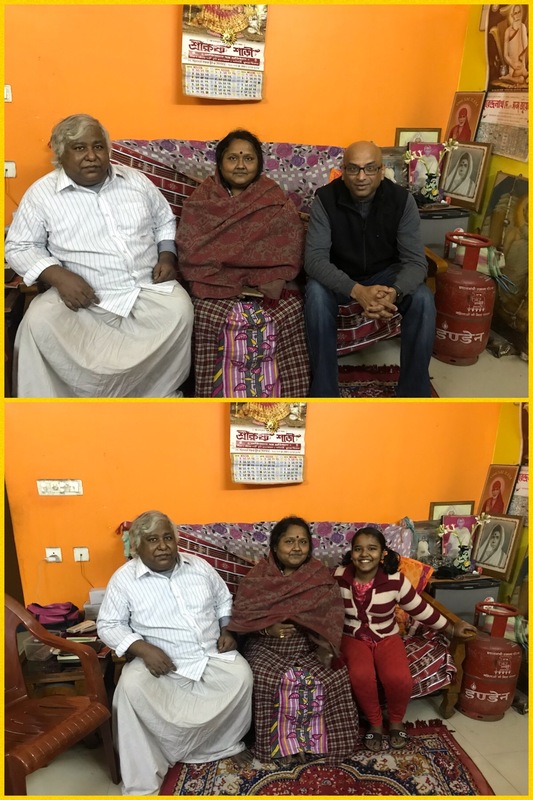 It was absolute the icing on my Durgapur visit cake to see the Sur family. Thank you Maitreyi for reaching out this morning. Memories of a lifetime gathered today. The backside of all these vehicles are usually a smorgasbord of exhortations. This one for example, is leaving nothing to chances and has written messages in three different languages. There is one that is a mix up of two languages – “Horn Maro”. 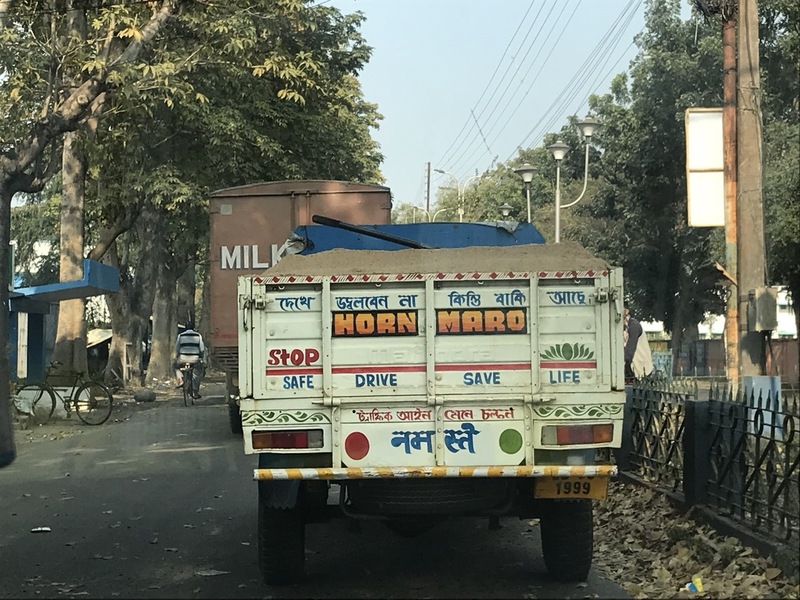 It would mean honk your horn. For some unknown reason, if you get behind any of these vehicles, they want you to raise a ruckus like it is a fourth down and inches situation and the opposing team has decided to go for it!!! It also wants you to stop. Perhaps it does not like all that ruckus after all. And that line in Bengali? For a vehicle that is clearly on the wrong side of the road, that sentence is reminding you to obey the rules of the road! If that was not confusing enough for you, they have put a red traffic light and a green traffic light for you. This would not be Indian hospitality and humility at the end of the day, if they had not put that “namastey” in Hindi in between those two confusing lights!! I used to visit this guy almost everyday if I was in Durgapur. I really liked him. Or was it his sister? I forget now. But it is true that he and I used to be pretty close at one point of time. Marrying his sister fixed that problem!! Like clockwork, I would show up at his house in my dilapidated Vijay Deluxe scooter on winter mornings and he would still be in his sleeping clothes. He would just put a couple of layers on and we would sit out in the sun outside their house and talk about – whatever it is that we used to talk about in our twenties. Till his mom would declare that his sister had finished cooking noodles for us. After reaching my mother-in-law’s house, I had called up my brother-in-law and let him know that I was with her. He, in his turn, decided to come over to Durgapur too. Five hours later, he was there. I went back to their place in the evening. With a bottle of wine and some dinner that I had picked up from one of the restaurants. Well, my mother-in-law did not partake of any of the wine but you would not have realized that given the amount she was laughing. What was remarkable was that my brother in law mentioned that that was the first time he had noticed her laughing like that after losing her husband. I had finally managed to track down Smitan – or “Buri”, as we used to call her – a few months back. She is one of the last neighborhood kids that I have managed to find. I spent about three years in that neighborhood and had friends in ten of the twelve houses. I am down to one last house after this. 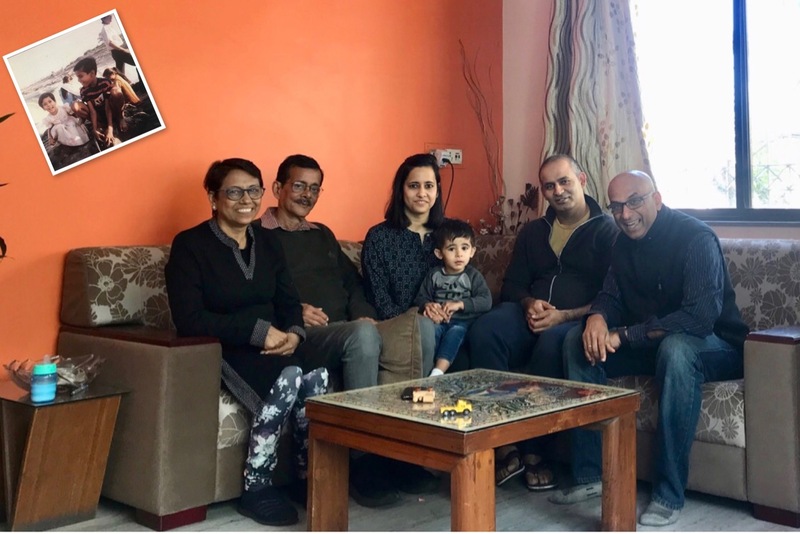 The last time I saw Buri was when my sister got married – that is a good two and a half decades back! I had received a few updates here and there in between. I had heard about Buri getting married and then about her dad (“Dutta Kaku”, as we call called him) passing away suddenly. But never had managed to talk to her till a couple of months back. Surprised her last evening by walking into their house unannounced!! We continued with the reminiscing of those days right where I had left them with Bhoju and Paku a couple of days back! Got a chance to meet her husband and daughter too! Finally got some one on one time with him!! Every family has one of these guys. The ultimate go-to guy. For us, it is my maternal uncle (mother’s only brother). 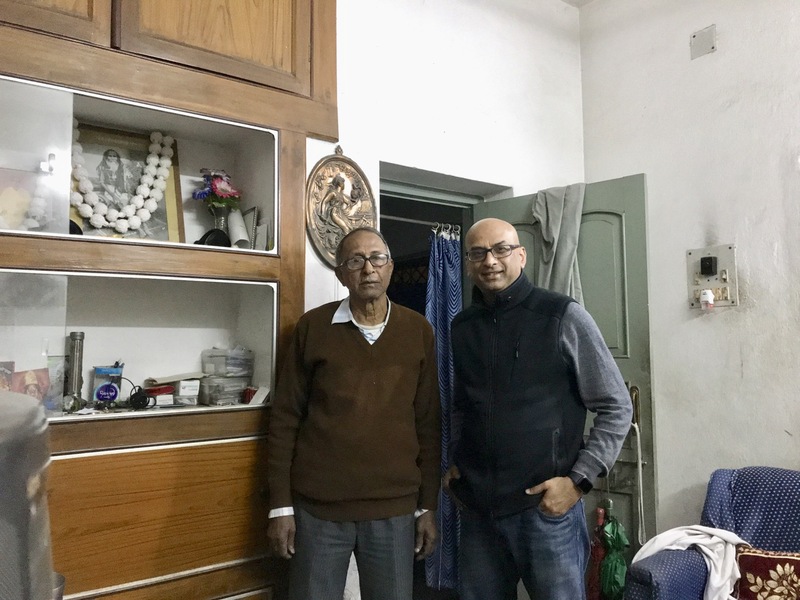 Long time back, my father had helped him get a job in the same company he used to work in and had moved him to Durgapur. Ever since, he is a permanent feature in our lives. Always the person we turned to when we needed help. I needed to be rushed to the hospital after being felled by typhoid? He was the one who took me. While his wife was having a baby at the same time in the same hospital! 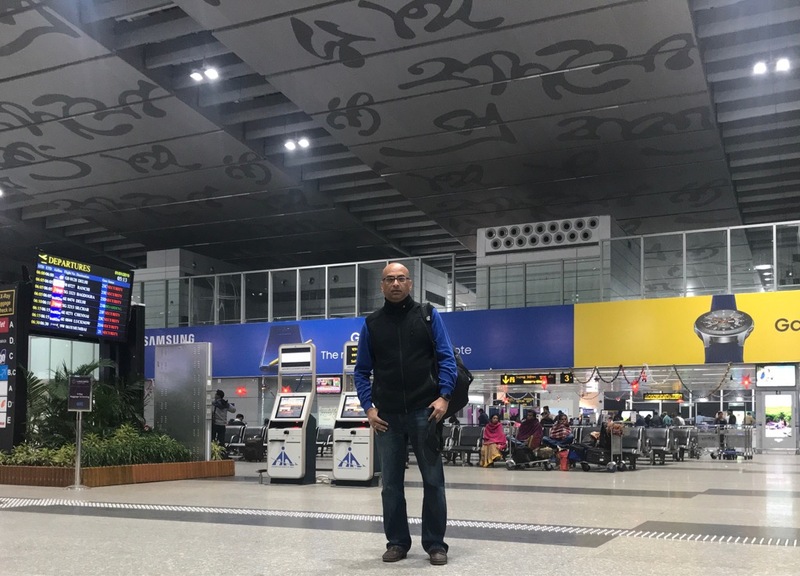 Rushing my dad to Kolkata by train when we almost lost him to sodium deficiency? Again, my uncle was the guy! A total rock solid stand up kind of person. Our family – I suspect like many others – are filled with emotional decision makers with a particular penchant for the drama. Not this guy. It used be fun growing up watching him articulate very logically constructed, see-from-both-sides arguments to any decision making that was at hand. It has never been the case that I was in Durgapur and I did not visit him. However, over the years, most of the time was spent catching up with my cousins (his three kids) and then when the nephews and nieces started happening, playing with them. Last ten years or so, I have spent most all of my visit time with his youngest grandkid – who is one ball of energy. Yesterday was different. Nobody was home. My cousin and his family was out for the day. I spotted my uncle walking down the street as I entered. I asked my driver to drop me there and started walking along with my uncle. We came back home and chatted for another hour. It was the first time after a long long time, I got one on one time with him. It was a great throwback to those years about four decades back. Those logically constructed arguments, that ability to see everything from both sides of a position – everything is still there! Best part was catching up on our common memories of my grandfather and grandmother. 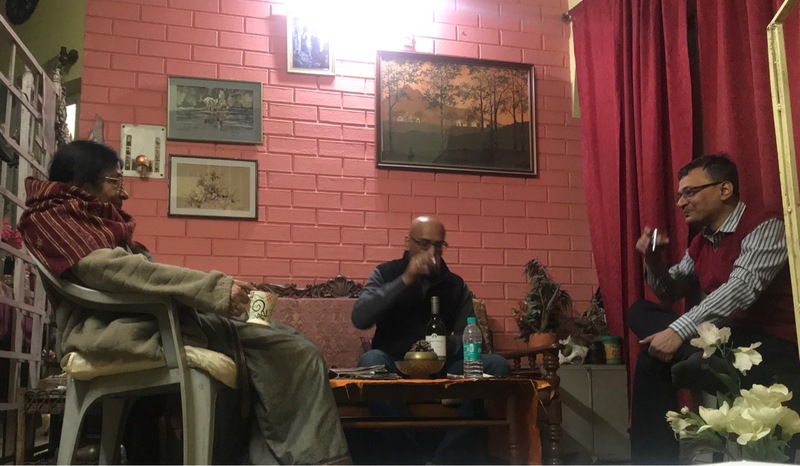 During my trips to India to check on my parents, a must-do is to swing by Durgapur (about three hours of drive from my parents’ place) for a day. Usually, my father in law would enquire about the folks he met when he visited us in the USA and about the various things he saw in our house. (The pool was his favorite). My mother in law and I would, in general, keep arguing about why I was not eating all sorts of food she would have had prepared and sticking to my routine of a cup of tea. This was the first time I was visiting her after my father in law passed away a few months back. It was a wee bit strange to me to enter the house knowing that he is not there. I was also not sure where my mother in law’s mental state was. Last month when Sharmila came to check on her, one of her relatives had mentioned about the blogpost I had written about my father in law. My mother in law consumes her digital devices only in a minimum 31 inch screen size (her constant companion – the TV) but when it comes to a phone or Facebook, she is totally a reluctant neophyte. She had asked if somebody could read out the blog to her some time. This time before I left home, I had collected about twenty of my blogs with my father in law’s pictures in them and printed them out for her. As you can see from the picture here, she pored over the articles and read them slowly and painstakingly. The article she is reading here IS the one that the relative had mentioned. The story was about me meeting my father in law’s American manager (Charlie from TVA) when he had just entered job life. My mother in law would read one line at a time and then lament that my father in law would have been so happy to hear that I had met Charlie or she would ask me all sorts of questions about Charlie (how old is he? is he tall?). I did not let her on to anything. That slow reading and continuous interruptions continued for a good half an hour. Then it stopped as she started reading up the end of it. Finally, she finished it and looked at me. She realized it was just a dream. You could see she was choking up too much fighting her tears to say anything. It was December, 1979. We had just moved to a new neighborhood. I was yet to be a teenager. One of the first kids who came to introduce themselves were these two brothers – barely 5 and 3 years old then. Found out their names were pretty long – so they went by Bhoju and Paku. Also found out that their mom was a schoolteacher like mine – although very different schools. 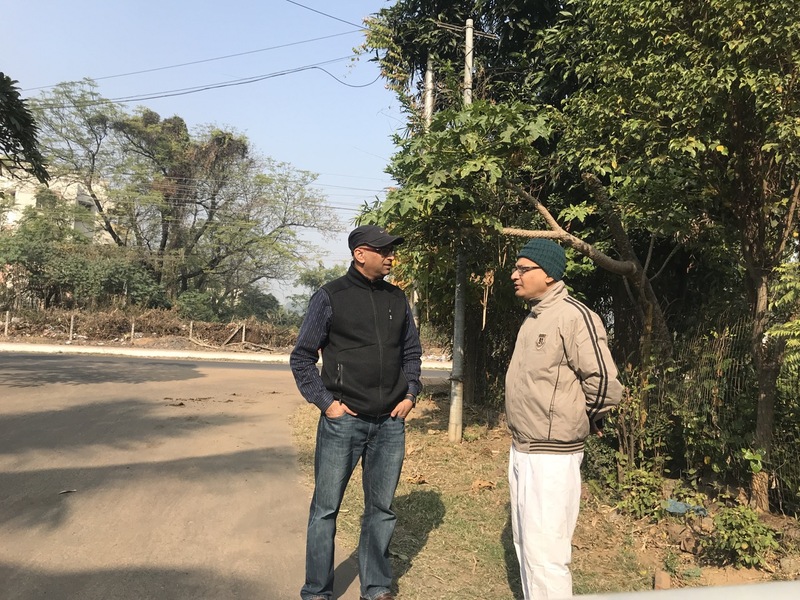 For the next few years, before I left home at the age of 16, Paku and Bhoju were part of our neighborhood games like soccer and cricket every evening. And during holidays and vacation, we would gather to play in the morning too. The thing I remember most about Bhoju (the younger one) is how pleasant and uncomplaining he used to be even in those days. There were positions in the teams that were unpopular – goalkeeper for soccer or the one near the boundary line for cricket – since they were not too close to the action. It was difficult to convince anybody to man those positions. Except Bhoju. He was always willing to go stand wherever he was asked to. Never said No. More importantly, he would put in his heart and soul into the game from there!! I had lost touch with both the brothers over time. 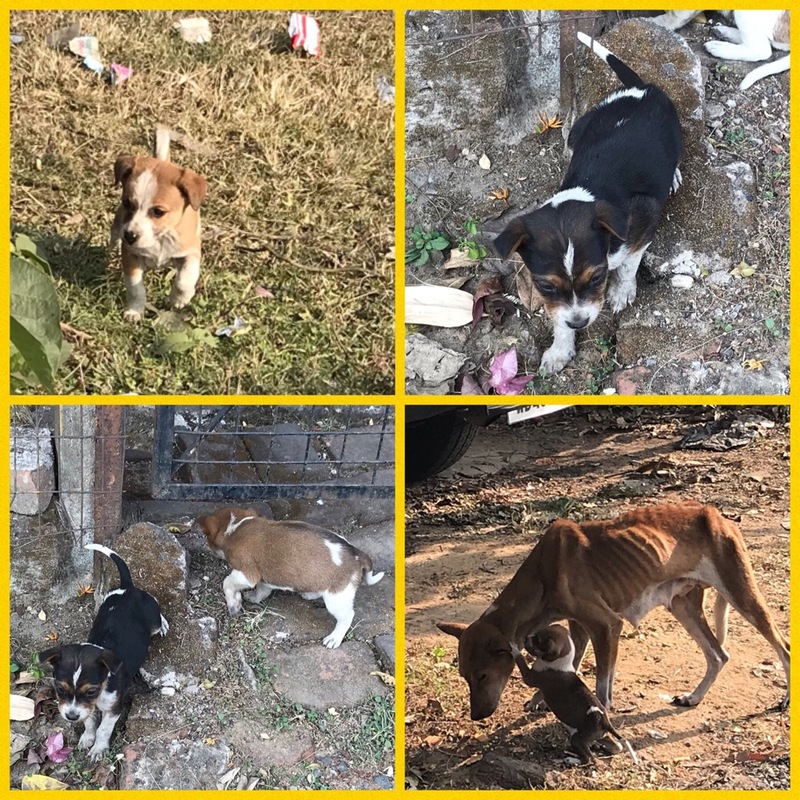 And then thru a common friend – Antara – who had moved into the same house after we left that neighborhood too – had helped me get hold of Bhoju. If you go to my blog – www.rajibroy.com and go to the posts of Nov 6, 2013, you will read about how I had finally cornered Bhoju in a cafeteria of a bank building in London where he was doing some projects and I had stopped by in London for half a day. From then on, I have kept up with the brothers – certainly with those birthday phone calls. Also got to know about their wives and kids thru Facebook. 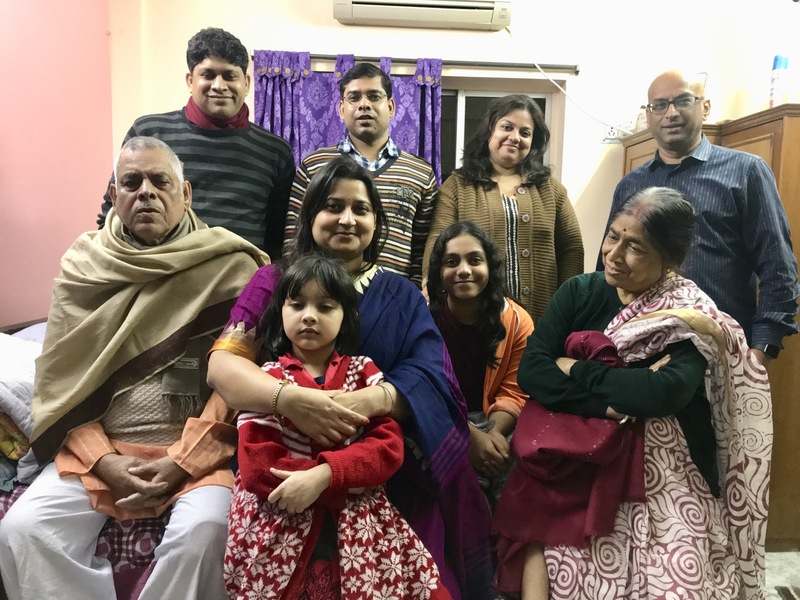 Finally, yesterday – lot of thanks to Tathapi (Bhoju’s wife) – I was able to meet the whole Chakraborty family in one place. Both the brothers and their families were there. So was Swapna masi and Chakraborty kaku!!! As you can imagine – it was a great evening remembering those good old childhood days. We talked about the “masi” (lady) who worked as a help in their house (my neighborhood peeps who are reading this might remember her famous words after she got exasperated with the two brothers – especially Paku – “Bagaaitey pari nai, jhikimiki legey jaay” ). We talked about those neighborhood games… those “pochisey boishak” skits we used to put up and those hilarious non-acting we used to do! The hours just went by. Eventually, it was time for me to take leave. It was great to see everybody in the Chakraborty family. But the most heartening was to see that both Kaku and Masi are keeping up with their good health! !